Never mind finding Nemo -- RTG's new Megaquarium features lots of playful Clown Fish that double wins! The new game's bonus rounds give progressively bigger prizes – up to 100X payouts. 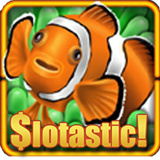 Slotastic, which has hundreds of real money online slots from Realtime Gaming, is offering 50 free spins on the new game and keeping the fish fun flowing by doubling deposits. Fancy fish frolic and free spins lead to more free spins in this deluxe new slot from RTG. Hitting Free Games symbols during regular play starts the first round of free games. Wins are doubled on these first free spins and on the last one they can be up to 100X. Bonus Symbols trigger Bonus Games with nothing but Wilds on one reel. Then, Super Game symbols during Bonus Games initiate three more free spins with 5X payout. Finally, Mega Bonus symbols during super Games start another round of free spins with even more Wilds. New game from Realtime Gaming has three-stage bonus round. “Once you get started on the bonus rounds the payouts can really add up!” said one Slotastic player. “One round of free spins leads to another, and there are more and more Wilds as you go from Super to Mega bonuses! Until the end of the month, Slotastic players can get 50 free spins on the new game and get deposits up to $333 doubled. All players that have made a deposit in February are eligible.